At the starting line for the 2017 Akron Marathon, Chief Strategy Officer Shawn Lyden talks with #ACHero patient Matt “Story Teller” Tullis, who is pediatric cancer survivor and was the official race starter. For more than 4 decades, Shawn Lyden, chief strategy officer at Akron Children’s, has been a runner. He started as a high school cross country athlete and continued to run as an adult, making the activity an integral part of his fitness routine when he had time. But like so many people, other commitments or the weather sometimes sidelined his workouts. Turning 50 changed Shawn’s priorities, however. The reason was Shawn’s family history of cardiovascular disease. Shawn’s dad, who had heart disease, experienced a heart attack at age 52 and ultimately passed away at age 59 from a second heart attack. Shawn also had cholesterol problems, a condition that he attributed to his family history. Regardless, he didn’t want to take any chances and decided to control his risk factors. 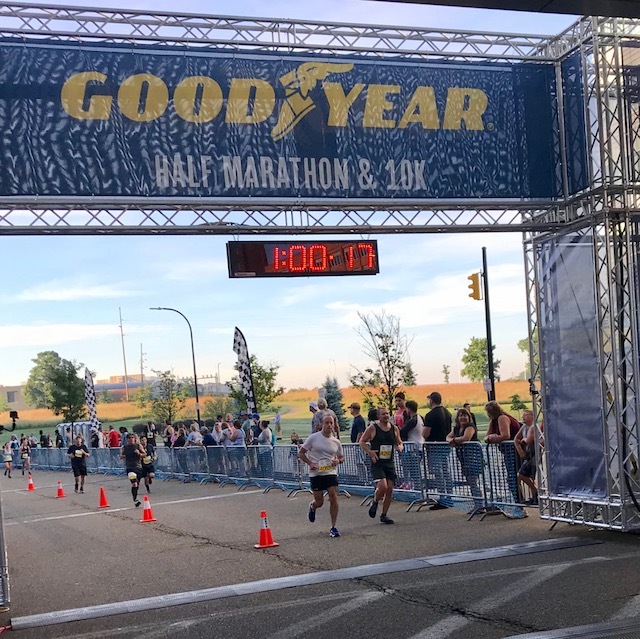 Shawn crosses the finish line during the second race of the 2018 series: Goodyear Half Marathon and 10K on Aug. 11. When Shawn first began prioritizing his wellness and health, he did it incrementally and through trial and error. That way, he weeded out what didn’t work for him. For example, since he disliked running outdoors on snow and ice, he joined a gym near his home where he could use cardio machines and lift weights in the winter. More recently, he started waking up at 4:30 or 4:45 a.m. to exercise at home before work. Shawn is already planning how to stick to that routine during the colder months. Shawn with this daughter, Ali, at the 2003 Akron Marathon. While he no longer runs competitively, Shawn does look forward to the Akron Children’s Hospital Akron Marathon Race Series each year. In the 15 years the Akron Marathon has existed, he has run the full marathon, 2 half marathons and multiple team relays. 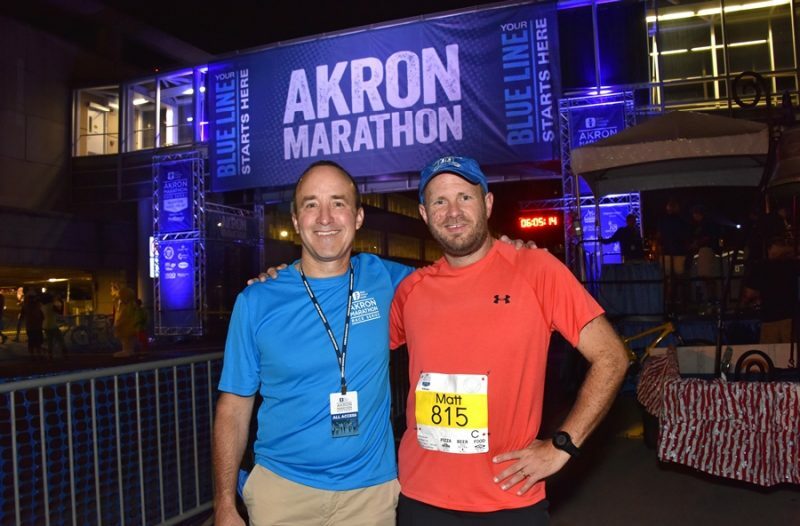 This year, he plans to run on one of the relay teams with colleagues from Akron Children’s in the First Energy Akron Marathon, Half Marathon & Team Relay. In addition to running, Shawn’s commitment to overall wellness has also led to trying new forms of exercise. His wife is a yoga instructor and through her example, he now practices yoga, although not as frequently as he would like.